Edited version of an article that originally appeared in The Jewish Chronicle on November 3, 2017. "The Balfour Declaration promised Palestine – over which Britain had no legal right – to a people who had no claim whatsoever to the country, nor did even live there." So goes the standard Palestinian indictment of the British government's pledge to facilitate "the establishment in Palestine of a national home for the Jewish people" provided that "nothing shall be done which may prejudice the civil and religious rights of existing non-Jewish communities in Palestine." It's an emotionally gripping claim, but is also the inverse of the truth in at least three key respects. Britain had the right to make the declaration; the Jewish people had a claim to Palestine deriving from a millenarian attachment to the land; and no other nation that could stake a similar claim existed at the time. To begin with, this was the dawn of a new historical era. The national idea as the organizing principle of the international system was taking its first hesitant steps as the victorious powers of WWI carved territorial states from the collapsed Ottoman, German, Habsburg, and Russian empires. Having defeated the Ottoman Empire, Britain's right to freely dispense with its territories wasn't challenged by the Arabs. As a pivotal member of the victorious alliance and the power that singlehandedly defeated the Ottoman Empire, Britain's right to dispense with Ottoman territories as it saw fit was never challenged by the Arabs. Quite the reverse: their standard grievance was that the actual dispensation of these territories contradicted London's wartime promises to the "Arab movement" by establishing a string of Arab states (Hijaz, Iraq, Transjordan, Syria, Lebanon) instead of a unified Arab empire and excluding Palestine from the territory of this prospective empire. The Arab indictment of the Balfour Declaration has nothing to do with its legality and everything to do with its substance. This in turn means that the Arab indictment of the Balfour Declaration has nothing to do with the legality of its issuance and everything to do with its substance. That is: recognition by the then foremost world power of the Jewish people's right to national self-determination in its ancestral homeland – something the Palestinian leadership refuses to accept to this very day. And just there, no doubt, lay the declaration's supreme importance. For no less important than its momentous message was the rapidity with which it was endorsed by the contemporary international community. Already in the process of its formulation, the British government sought the approval of US President Woodrow Wilson for the declaration. Once issued, it was quickly endorsed by most members of the Anglo-French-Russian-led war coalition before being incorporated into the August 1920 Turkish Peace Treaty partitioning the defunct Ottoman Empire, then into the July 1922 League of Nations' Mandate for Palestine, with Britain charged with its implementation. In other words, within five years of its issuance, the Balfour Declaration had come to reflect the will of the international community as represented by a major official resolution by its newly established world organization (the UN's predecessor). This was not only in the "practical" sense of supporting the creation of a Jewish national home in Palestine, but in the deeper sense of recognizing "the historical connection of the Jewish people with Palestine and ... the grounds for reconstituting their national home in the country" (in the words of the League of Nations' mandate). It is precisely this early international acceptance of Zionism as national rebirth in an ancestral homeland, rather than colonial encroachment on an indigenous populace, that the Palestinian Authority seeks to debunk by demanding an official British apology for the declaration. Ironically, it was not only the "imperialist Western powers" and other extra-regional nations that recognized the historic Jewish attachment to Palestine and the attendant right to national rebirth, but also leaders of the nascent pan-Arab movement. A few months after the issuance of the Balfour Declaration, the leader of the Zionist movement, Chaim Weizmann, who had played an important role in its issuance, led a Zionist commission to the Middle East to explore ways and means for implementing the declaration, including "the establishment of good relations with the Arabs and other non-Jewish communities in Palestine." In Cairo, he managed to persuade a number of prominent exiled Syrian and Palestinian nationalists "that Zionism has come to stay, that it is far more moderate in its aims than they had anticipated and that by meeting it in a conciliatory spirit they are likely to reap substantial benefits in the future." He also succeeded in allaying the fears of the Egyptian Sultan (later King) Fuad of Zionism's alleged designs on Islam's holy places, especially its supposed intention to destroy the Dome of the Rock and to reestablish the Jewish temple on its ruins. 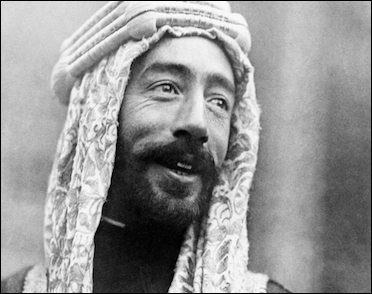 Emir Faisal ibn Hussein, who headed the lead army of the "Great Arab Revolt" against the Ottoman Empire, formally agreed to "encourage and stimulate immigration of Jews into Palestine on a large scale." Yet his most important achievement was the establishment of a personal relationship with Emir Faisal ibn Hussein of "Great Arab Revolt" fame – the effective leader of the nascent pan-Arab movement. The two struck an immediate rapport in their first meeting (on 4 June 1918), with Faisal readily conceding "the necessity for cooperation between Jews and Arabs" and "the possibility of Jewish claims to territory in Palestine." Yet it took several more months and a string of further meetings for the two to sign an agreement (on 3 January 1919) supporting the creation of a Jewish national home in Palestine in accordance with the Balfour Declaration and the adoption of all necessary measures "to encourage and stimulate immigration of Jews into Palestine on a large scale." In a letter to a prominent American Zionist a couple of months later, Faisal amplified this pledge: "We Arabs, especially the educated among us, look with the deepest sympathy on the Zionist movement ... and we regard [the Zionist demands] as moderate and proper. We will do our best, in so far as we are concerned, to help them through: we will wish the Jews a most hearty welcome home." Nor was Faisal the only regional leader to accept the Jewish right to national revival. On 12 August 1918, the Ottoman Grand Vizier Talaat Pasha issued an official communique expressing "sympathies for the establishment of a Jewish religious and national center in Palestine" and offering "to put this work under the high protection of the Ottoman Empire, and to promote it by all means which are compatible with the sovereign rights of the Ottoman Empire that do not affect the rights of the non-Jewish population." 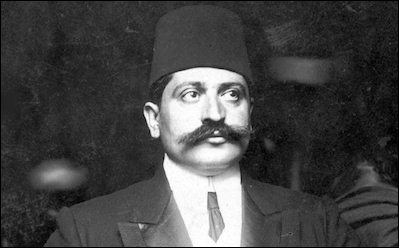 Ottoman Grand Vizier Talaat Pasha issued an official communique in the final months of World War I supporting "the establishment of a Jewish religious and national center in Palestine ... under the high protection of the Ottoman Empire." Largely modeled on the Balfour Declaration and formulated in a similar process of lengthy discussions with prominent Jewish leaders, the Ottoman proclamation came too late to make a real difference: two-and-a-half months after its issuance the Muslim empire surrendered to the Allies. Yet its issuance was nothing short of extraordinary, given the violent Ottoman reaction to anything that smacked of national self-determination, from the Greek war of independence in the 1820s, to the Balkan wars of the 1870s, to the Armenian genocide of WWI. Indeed, only a year before Talaat's declaration, the Jewish community in Palestine faced a real risk of extinction for the very same reason – only to be saved through intervention by Germany, the Ottomans' senior war ally. It is true that all these declarations were largely influenced by instrumental considerations, notably the desire to win over the mythic "international power of the Jews," though approval of Zionism as a worthy national movement, rather than merely as a handy tool, was gaining wide currency in the higher reaches of the British political and administrative establishment. Prime Minister Lloyd George, for one, was a firm believer in the ideal of Jewish restoration and England's need to support it. Yet the fact that support for the Jewish national revival in Palestine – and nowhere else – was invariably considered the natural quid pro quo for "World Jewry's" purported wartime support underscores the pervasive recognition of the millenarian Jewish attachment to this land in both the Christian and Muslim worlds. Recognition of the millenarian Jewish attachment to this land was pervasive in both the Christian & Muslim worlds. By contrast, there was no indigenous nation that could stake a similar claim to the land. Palestine at the time did not exist as a unified geographical entity but was divided between the Ottoman province of Beirut in the north and the district of Jerusalem in the south. Its local inhabitants, like the rest of the Arabic-speaking communities throughout the empire, had not experienced the processes of secularization and modernization that preceded the development of European nationalism in the late 1700s. Instead, they considered themselves Ottoman subjects rather than members of a wider Arab nation let alone a Palestinian one. Their immediate loyalties were parochial — to clan, tribe, village, town, or religious sect — which coexisted alongside their overarching submission to the Ottoman sultan-caliph in his capacity as the religious and temporal head of the world Muslim community. As late as June 1918, less than four months before the end of hostilities in the Middle East, a British report noted the absence of "real patriotism amongst the population of Palestine." 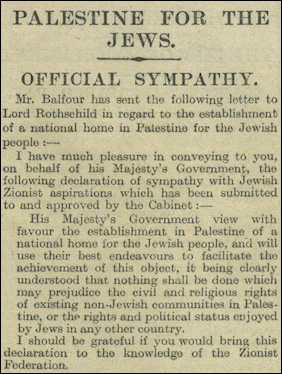 The Balfour Declaration generated no immediate antagonism throughout Palestine. In these circumstances, it was hardly surprising that the Balfour Declaration generated no immediate antagonism throughout Palestine. For years after its issuance, many Palestinian Arabs remained ignorant of its actual substance, with the name Balfour denoting an idea, power, money to promote Jewish settlement, or, better still, an opportunity for self-enrichment. In the words of a sheikh in the vicinity of Gaza: "Tell Balfour that we in the South are willing to sell him land at a much lower rate than he will have to pay in the North." When the first wave of anti-Zionist violence erupted in April 1920, it was driven not by the demand for independence but for the incorporation of Palestine into the Syrian kingdom established by the very same Faisal, who only a year earlier had warmly endorsed the Balfour Declaration. 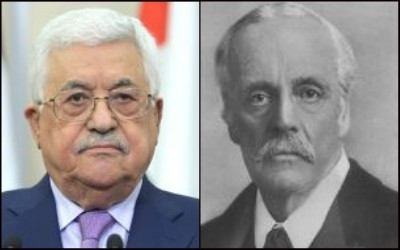 There is thus a good measure of historical irony in the Palestinian leadership's adamant denial of a reality accepted 100 years ago by the international community, including many Palestinian Arabs, the head of the pan-Arab movement, and the world's foremost Muslim power. Rather than keep trying to turn the clock back at the certain cost of prolonging their people's suffering, it is time for Palestinian leaders to shed their century-long rejection of the "other" and opt for peace and reconciliation. And what can be a better starting point for this process than endorsement of the Balfour Declaration, rather than its atavistic denigration?